This week's lesson was "Leave It", which Zeke has a little practice at using. As Zeke is often required to "Leave It" in respect to Mack the cat and deer poop. He made mom pretty proud. We also practiced walking on a loose leash. Michael wanted Zeke to try some different kinds of leashes to see if any gave mom better control of wild man Zeke. 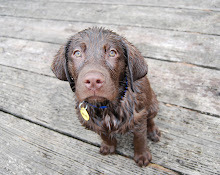 The first one we tried was a Gentle Leader Head Collar. It looked a little bit like a muzzle to mom and Zeke was really starting to stress out about having it on, and that in turn stressed out mom. The trainer said it is something that the dogs have to get used to if you are going to use it. We took it off but it definitely gave a lot of control with very minimal force. And although it looks muzzle-ish, Zeke was still able to take treats and give kisses. It was really great for Michael to let us try it out, but just not the right solution for Zeke and mom. The other one we tried out was like a harness, but the leash clipped to the front of the chest. 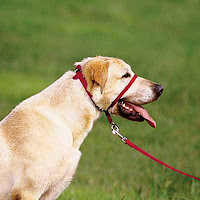 It was also made by Gentle Leader and was called an Easy Walk Harness. That one seemed pretty awkward, so we just switched back to the trusty ol' slip lead. It was probably all the stress of the different collars and being happy to be back to normal, but once Zeke got back to the slip lead he was pretty easy to walk. Still crazy trying to sit still in the classroom, but we are making progress.